UPDATED: Sun., March 18, 2018, 12:10 a.m.
BOISE – Riccardo Fois can say he took the hardest charge of Gonzaga’s 90-84 win over Ohio State, and even if it cost him a pair of eyeglasses, the Bulldogs’ fourth-year video coordinator was proud to wear a first-half hit from Josh Perkins. 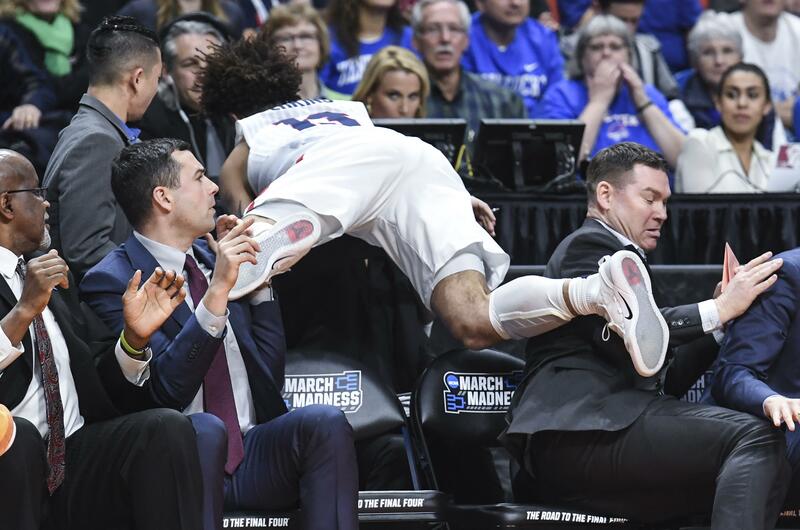 Perkins was running full steam toward the GU bench, trying to save a loose ball, when the senior point guard dove into Fois, planted in a chair behind Zag assistants Tommy Lloyd and Brian Michaelson. Perkins wrapped up the video man and Fois’ body provided a cushion between the player and metal barrier set up right behind GU’s bench. One of the game’s greatest saves, no doubt. Perkins was unharmed and the guard played an important role for the Zags the rest of the game, finishing with 10 points and eight assists. But Fois didn’t come out of the collision quite as clean. His glasses were mangled as the 6-foot-3 guard landed on top of him. Published: March 17, 2018, 8:31 p.m. Updated: March 18, 2018, 12:10 a.m.